Many adolescents who abuse drugs have a history of physical, emotional, and/or sexual abuse or other trauma. A relapse signals the need for more treatment or a need to adjust the individual’s current treatment plan. Adolescent substance use needs to be identified and addressed as soon as possible.Drugs can have long-lasting effects on the developing brain and may interfere with family, positive peer relationships, and school performance. Most adults who develop a substance use disorder report having started drug use in adolescence or young adulthood, so it is important to identify and intervene in drug use early. Adolescents can benefit from a drug abuse intervention even if they are not addicted to a drug.18 Substance use disorders range from problematic use to addiction and can be treated successfully at any stage, and at any age. For young people, any drug use (even if it seems like only “experimentation”), is cause for concern, as it exposes them to dangers from the drug and associated risky behaviors and may lead to more drug use in the future. Parents and other adults should monitor young people and not underestimate the significance of what may appear as isolated instances of drug taking. Substance use disorder treatment should be tailored to the unique needs of the adolescent. Treatment planning begins with a comprehensive assessment to identify the person’s strengths and weaknesses to be addressed. Appropriate treatment considers an adolescent’s level of psychological development, gender, relations with family and peers, how well he or she is doing in school, the larger community, cultural and ethnic factors, and any special physical or behavioral issues. Treatment should address the needs of the whole person, rather than just focusing on his or her drug use. The best approach to treatment includes supporting the adolescent’s larger life needs, such as those related to medical, psychological, and social well-being, as well as housing, school, transportation, and legal services. Failing to address such needs simultaneously could sabotage the adolescent’s treatment success. Behavioral therapies are effective in addressing adolescent drug use. Behavioral therapies, delivered by trained clinicians, help an adolescent stay off drugs by strengthening his or her motivation to change. This can be done by providing incentives for abstinence, building skills to resist and refuse substances and deal with triggers or craving, replacing drug use with constructive and rewarding activities, improving problem-solving skills, and facilitating better interpersonal relationships. Families and the community are important aspects of treatment. The support of family members is important for an adolescent’s recovery. Several evidence-based interventions for adolescent drug abuse seek to strengthen family relationships by improving communication and improving family members’ ability to support abstinence from drugs. In addition, members of the community (such as school counselors, parents, peers, and mentors) can encourage young people who need help to get into treatment—and support them along the way. Effectively treating substance use disorders in adolescents requires also identifying and treating any other mental health conditions they may have.Adolescents who abuse drugs frequently also suffer from other conditions including depression, anxiety disorders, attention-deficit hyperactivity disorder (ADHD), oppositional defiant disorder, and conduct problems.23 Adolescents who abuse drugs, particularly those involved in the juvenile justice system, should be screened for other psychiatric disorders. Treatment for these problems should be integrated with the treatment for a substance use disorder. Sensitive issues such as violence and child abuse or risk of suicide should be identified and addressed. Many adolescents who abuse drugs have a history of physical, emotional, and/or sexual abuse or other trauma.24 If abuse is suspected, referrals should be made to social and protective services, following local regulations and reporting requirements. It is important to monitor drug use during treatment.Adolescents recovering from substance use disorders may experience relapse, or a return to drug use. Triggers associated with relapse vary and can include mental stress and social situations linked with prior drug use. It is important to identify a return to drug use early before an undetected relapse progresses to more serious consequences. A relapse signals the need for more treatment or a need to adjust the individual’s current treatment plan to better meet his or her needs. Staying in treatment for an adequate period of time and continuity of care afterward are important. The minimal length of drug treatment depends on the type and extent of the adolescent’s problems, but studies show outcomes are better when a person stays in treatment for 3 months or more.25 Because relapses often occur, more than one episode of treatment may be necessary. Many adolescents also benefit from continuing care following treatment,26 including drug use monitoring, follow-up visits at home,27 and linking the family to other needed services. 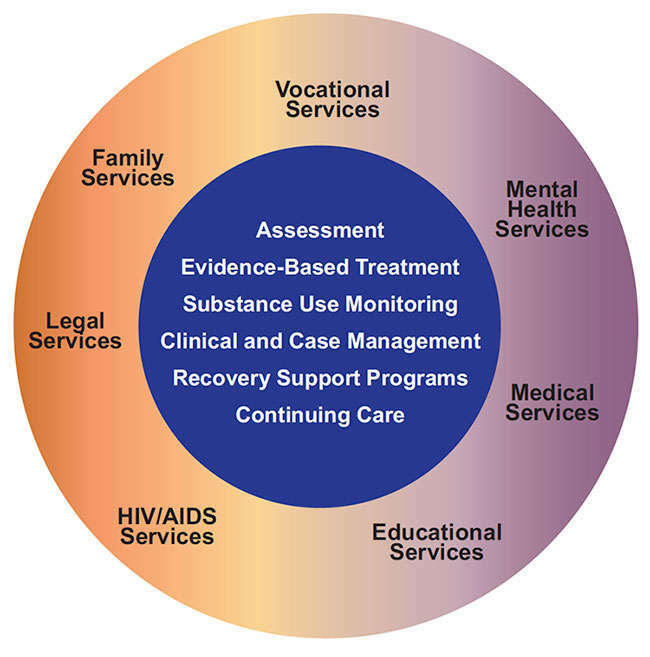 Components of Comprehensive Drug Abuse Treatment The best treatment programs provide a combination of therapies and other services to meet the needs of the individual patient. Next Why do adolescents take drugs?